RIT students Gary Porter, left, and Dan Plate won first place in the Visual Quality category of the 2015 Intel University Games Showcase. 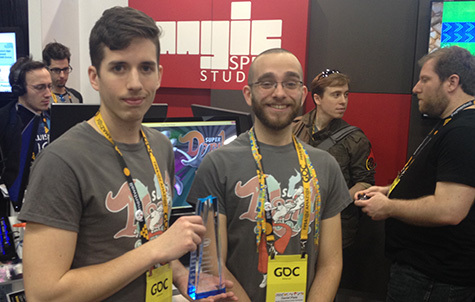 RIT students Dan Plate and Gary Porter won first place in the Visual Quality category of the 2015 Intel University Games Showcase for their soon-to-be released video game, Super Daryl Deluxe. The awards were presented Thursday night (March 5, 2015) as part of the national Game Developers Conference 2015 in San Francisco. Super Daryl Deluxe is an action role-playing game featuring unique combat system and visual style. A free demo is available on the Super Daryl game website. The game was on display at the conference booth hosted by RIT’s MAGIC Spell Studios, the commercial, for-profit element of the Center for Media, Arts, Gaming, Interaction and Creativity (MAGIC). This was the first year MAGIC Spell Studios had a booth on the conference floor, and the game drew attention and praise from conference attendees. Plate is a fourth-year illustration major and Porter is a fourth-year student majoring in game design and development. Both are from Waterloo, N.Y. Their company, Dan and Gary Games, is being incubated in MAGIC Spell Studios, and this will be the first game to be released by that company. It is expected to be published and released within a year. “I am incredibly proud of Dan and Gary, their work ethic, passion and talent is unlike any that I have seen in a really long time,” said Jennifer Hinton, MAGIC’s assistant director. “We at MAGIC Spell Studios are thrilled to be a part of their story and are looking forward to helping them publish the game and get it in the hands of an already eager audience." More than 100 RIT students, alumni, staff and faculty are in San Francisco this week for the conference, the world’s largest professional gaming industry event of the year. The conference, which ended Friday, is a key learning and networking opportunity for both aspiring and professional game developers. Students attending the event had access to hundreds of lectures, panels, tutorials and discussions given throughout the week by gaming industry leaders. And GDC’s bustling expo floor featured recruiters from virtually every major gaming company, providing developers with their first look at emerging industry software and technology. Splattershmup: Described as “a game of art and motion,” Splattershmup was released by MAGIC for free Feb. 26 and is available to play online. The game blends the classic shoot-em-up arcade game genre (i.e. Asteroids) with the mechanics of abstract painting. A.V. : A puzzle game that puts players in control of a self-aware music program trying to escape termination. The game was released on Steam, the world’s largest digital distribution platform for games, on Feb. 15 for Mac, PC and Linux systems. Wulverblade: A side-scrolling action game being created for the Xbox One and Steam platforms by local Rochester game developer Darkwind Media. The company has hired dozens of RIT alumni and students for full-time and co-op positions over the last several years. Wulverblade is being published through RIT’s Venture Creations. To see photos from the conference, go to the Tiger Beat Blog.